From the food we want to eat to the person we want to hire, all these are decisions that we take almost every day in our lives. Our decisions greatly impact our actions and hence they are an integral aspect of our lives. When we take decisions at home or in personal, then they hardly affect others. But when decisions are taken in the workplace, business, or any other area involving groups, it can create a great impact on others as well. Hence, in such situations, it becomes essential to possess excellent decision-making skills. What is Good Decision Making Skill? Decision making is an important skill in the workplace and is extremely vital if you wish to be a leader. Be it the decision to hire someone, or the process to adapt to complete a project, or any strategy to pursue, if you possess good decision-making skills then you will never go wrong with them. It is a process of making the right choices by analyzing a situation, combining information and assessing similar kind of other resolutions. 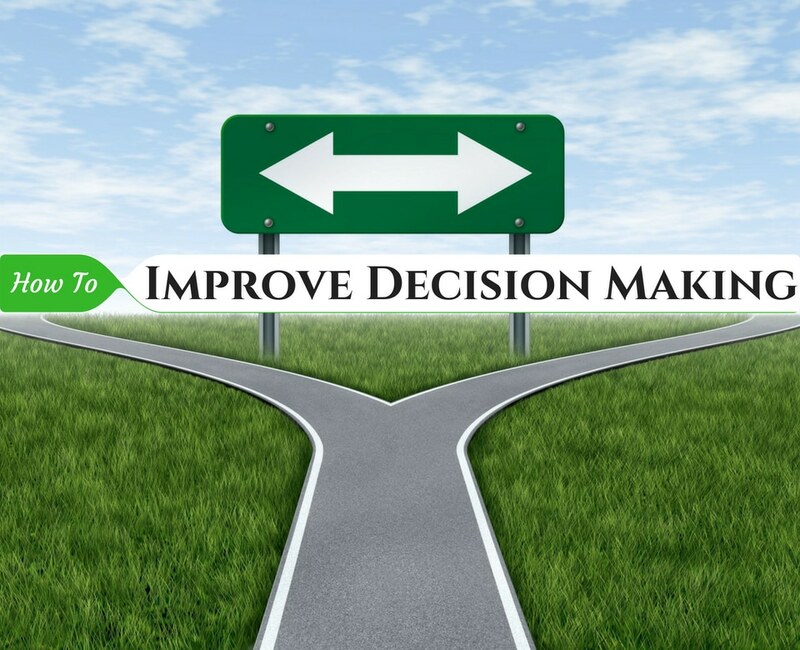 This decision making process helps you to make best decisions by evaluation all the information and alternate solutions. This will make sure that the decision taken will be best and satisfying one. If there is a need to make a decision, then it is very important to clearly define the nature of the decision initially. External– getting details through books, online etc. In the process of collecting information, you will surely come across many paths or alternatives. You can even use your imagination to create new alternatives. Once you get all the possible list of alternatives, you need to analyze each and every option and evaluate the end result of it. Check whether they are suitable for the first step. Enlist all the alternative on a priority basis. After all the evaluation, you need to select the best alternative that is suitale to you. You can also make use of combining 2 or more alternatives. Now is the time, to perform the action by starting to implement or make use of the alternative chosen in the above step. Review the result or outcome of your decision and check whether the need which you have identified in the step 1 has been solved or not. If not then , you must have to repeat few steps to make a new decision. Why is Good Decision Making Skill Important? ‘One formula does not fit all the questions.’ This holds true in the real life as well. Every situation is different with its own challenges and issues. As a result, we need to adopt distinct ways of approaching such situations and combating all the problems. If you take a wrong decision then things will go against you, but if you take appropriate decisions then things will work in your favor. But one thing you need to remember is to follow a systematic approach to decision making so that you are confident and confirmed about availing positive result from your decision. Lastly, if you don’t want to experience further troubles in a situation then taking good decisions is mandatory. Decision making process is very important for any business. Nothing can happen without making proper decisions. Moreover when it is related to a organization or business, there are several things that you need to think on before making decisions. Also in some instances , you need to make some instant crucial decisions. At times, what decision looked right yesterday might look wrong tomorrow. If you are taking a decision in a team , then it is obvious that you will get many opinions. Discarding any of them will be completely wrong. So to make the optimum decision, you can follow and move up higher starting from the last step mentioned. 1. Decide and finally declare. 2. Decide and communicate with others. 3. Present the decision and ask for comments. 4. Suggest a decision and appeal discussion. 5. Present the situation for input and joint decision. 6. Explain the situation and ask the team to decide. 7. The team is asked to define the problem and make the decision. How to Improve Decision Making Skills in the Workplace? At times of pressure and stress, the process of decision making plays a very crucial role. Though decision making is challenging, you need to be prepared to take decisions at any point of time. Here we have listed out some top ways that helps you improve your decision making skills. 7. List down the pros and cons. For all such reasons, having good decision-making skills is necessary. If you want to structure well your process of decision making and want to know the best ways to enhance your decision making, then check them below. Choices can vary from massive to single. Determining the certainties of your decision can support in decision making. Do little research and carefully consider the certainties associated with it before you attempt to make a decision. If the decision to be taken is regarding something smaller then you can always consider your gut feeling. This way you will end up making right decisions most of the times. If you need to take a decision, particularly for something important then you must first analyze why you need to make it. There might be certain reasoning and agenda that can affect your decision in the end. Determine the consequences that will occur from your decision. Hence, analyze who this decision is for and who will take advantage from it. Such information can help you accomplish a reason for making your decision as well as make a convenient choice. In most of the situations, you will have more than two choices. This will make you confuse to take an appropriate decision. Sometimes the choices are hidden. Hence, search for various options and organize them as per what would work the best, what the ends-results would be and more other, before you take a final decision. Before you make a decision it is essential that you ask relevant questions regarding it. The decision can be yourself or for someone else but make sure you make the decision that is in the best interest. An excellent way is to gain as much information as possible before you make a decision. Who will be benefited from your decision? What will be the results of the decision? Just try to analyze such things before making a sorted choice. Common sense plays a more pivotal role in decision making than the gut feeling. It can help you identify that whether you make the correct choice or not. Whenever you are making a decision just make sure it makes sense. May be you will not be able to make a decision that does not lead to the positive result, but if it makes sense then, it will never harm anyone. Listen to your common sense and use your logic to attempt it. Your common sense will help you make good decisions and can even land you with fruitful decisions when everything else has failed. There can be some situations when you feel trapped and tend to make rash decisions due to anger, sadness, and pride. This clearly indicates that emotions can be dangerous. They are more impulsive and can land you with incorrect decisions. Think with a relaxing mind just before you make a decision. Control your emotions and make appropriate judgments. Afterwards, all you require is logic and think wisely. Nobody is perfect from the beginning. We all tend to make wrong decisions at one point in time or the other. But this does not stop us from thinking meticulously about our next decision. We have to make decisions almost every day. Hence, we should not be afraid of it. The best way out is to learn from our past experiences. We must accept our past mistakes gracefully and explore suitable decision making, so that we end up making the right decision the next time. Before you reach an ultimate decision, it is essential that you measure all the pros and cons. This will ensure you to make the best decision. With a cost-benefit analysis, you will be able to examine the end-results from your decision. Estimate not just the positive ones but also the negative ones. This way you will be able to estimate the costs or the things that you have missed out while making a decision. To simplify your process of cost-benefit analysis it is wise to narrow down the choices of options available to you. When you have more choices then taking an appropriate decision becomes difficult. Also, more choices can result in more failures as you may miss out any profitable opportunity. With fewer options, you would avail more peace of mind and will be able to take a suitable decision in less time. The time you must spend on taking a decision depends on the importance of the situation. While some situations may require taking a decision in just 10 minutes, there can be other decisions that may even take few days to confirm. This all depends on the significance of the situation. To reduce agonizing indecision, identify the significance of making a decision and how much impact it will have on your life, your work, and other important things related to it. Don’t get panic with a situation. If you have a proper perspective on everything as well as the time frame for decision making, then it will make decision making simpler for you. This is linked closely with analyzing the importance of a decision. If your decision will not affect you as well as anyone else, then you can go forward and make it. If it is not a viable decision, then there is no point wasting your time. The best way is to look for other options. Sometimes you might have to make group decisions. This is more complicated than taking individual decisions. It is because this involves ideas and thoughts of various individuals with different perspectives and ideologies. In such situation, you can always avail a positive result only when you have the skill to manage conflicts efficiently. Practicing conflict management will help you identify differences between a winning and losing situation. In such situation, a good decision is one that involves a win-win situation from all the aspects. This is again related to group decision making. It is best to decide the details well in advance, especially when you are making group decisions. This will help to avoid conflicts among the team members. The group discussions can be related to planning out an event or going out for a party or planning a festivity in the office. It enhances the decision-making skills and reduces the likelihood of issues amongst the members. There is a time when you need to be assertive. If no one in the team is able to make a firm decision then you may take the charge. Otherwise, you will end up wasting the time and not taking an appropriate decision as per the situation. When you could have been productive and involved, then go for it. This is an excellent way to stand as a leader and take a decision, rather than waiting for others to step forward. One of the biggest ways to improve decision making is to make sure that you don’t repeat the issues from your past mistakes. Living with a regretting decision is just like harming your own potentials. This will ruin your ability to decide on things in a swift and efficient manner in the future. Hence learn from your past mistakes and try to make a right decision. If you need to make simple decisions then you must make them in a fun way that too in less time. But if the decision has to be made on an important subject then make sure you take enough time to think. When the time frame increases then this can make the overall situation more critical. A fine way is to dedicate a focused frame of time each day to analyze the pros, cons, positives, and negatives from the decision. Sweeping all the problems will also help you make a better decision. When you need to make decisions, particularly on the professional front then it is also best to focus on the facts. Invest your time there to identify, what a decision will make you feel and look. Is it possible to solve the problem objectively? If YES, then list out all the potential causes and keep your ego as well as emotions at bay. In addition to this, looking at the facts will help to eliminate all the personal deficiencies. If you want help with something related to your business then you must always ask for it. This is better than ending up with a failed decision. Last but not the least, when you make a final decision it is always best to question it. Might be you have taken a decision based on opinions and preferences of others or on the basis of any external support or on the basis of advice from others. In all such situations, there is a possibility that you might make an inappropriate decision. Hence, always ask yourself questions before you make a decision. Make sure your decisions are always qualitative and not just quantitative. If there is a requirement then you may even check with the latest industry trends. Hence, be vigilant about the inputs of your decision-making process. To conclude, decision making is important process that you experience every day. Some decisions might be small and less important while others are big and highly important. No matter what the significance of a decision is, the only thing you need to learn is to make right choices and enhance your decision making skill to the fullest.